For the next five days, I’m going to be immersing myself in the food of John Harvey Kellogg and the Battle Creek Sanitarium. All of the meals I’ve planned and the recipes I will be using come from The New Cookery be Lenna Francis Cooper (1914), who was at one time the head dietitian at Battle Creek. Whole Wheat Gems, Hashed Brown Potatoes, Pineapple, and Tea. Although I work from home, I don’t ordinarily bounce out of bed and fix myself a hearty breakfast. It ended up not taking that much time, and it felt like it could be a pleasant ritual. It also felt good to sit down to my first biologic meal. I can feel my intestines being cleansed already! 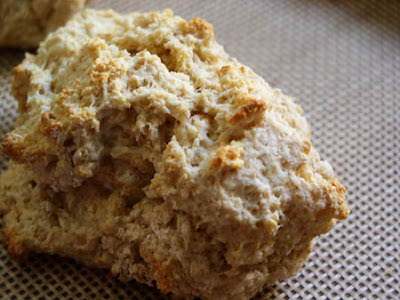 To make whole wheat gems, replace the grahams flour in the recipe with 1 cup whole wheat flour. A gem tin is essentially a cast-iron mini muffin pan, which, when greasy and hot, makes the gems extra crispy. I didn’t have a gem pan, so I made these into drop biscuits by adding a 1/4 cup less milk. I baked them for 9 minutes in a 450 degree oven. They didn’t take much time to mix up, and came out cute as buttons. They tasted alright–the sweetness was pleasing, but you could really taste the whole-granieness. I think they will be better tomorrow toasted and smeared with jelly. The hashed browned potatoes were the most difficult thing I made this morning. I only used one potatoes, and cut it into cubes. I originally baked them in a pan lined in tin foil, but when I took them out after 10 minutes they were sticking, and the brown crispy parts were tearing off. So I plucked them off the pan, burning my finger badly in the process, and dropped them into a non-stick skillet. I added the milk and popped them back into the oven, stirring after an additional five minutes. All in all, they cooked about 18 minutes. 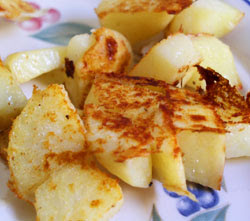 The potatoes mostly absorbed the milk, and there was also this crispy milk skin. They were pretty tasty, but I don’t think you can go very wrong with potatoes, salt and butter. I also cut up a fresh, sweet, heavenly pineapple and had a mug of herbal tea. Kellogg forbade caffeine, alcohol, and tobacco at the San; a few rules which we will ignore at the dinner party next month.